It all started when Tara inquired with a few vegan ladies about the best way to make vegan brownies. We planned to get together and try out some possibilities. I had all my ingredients packed up and recipes to try. Then disaster struck. Well, not really disaster. More like a wedding with a vengeance. Ok, not that either. Really just normal wedding stuff. Normal “we haven’t gotten everything sorted and our wedding is in a month from today” craziness. Which turned into me spending the day planning and strategizing (which is pretty much what I do everyday now). Which meant, no brownies for me. Sad face. So, since I’m no brownie pro myself, I figured I’d better test the recipe I had before I sent it along. And with no time to be experimental, I turned to The Joy of Vegan Baking . The brownie recipe in this cookbook appealed to me as it included both applesauce and flax, which seems to me the perfect combo for a moist, but not oily brownie. I have to admit, these brownies were pretty darn good. They definitely leaned towards the gooey fudge side of brownies, which I rather like. I undercooked them a bit, on purpose to make sure they would be soft, and without eggs to worry about it’s not really a big deal. They didn’t quite amount to the perfect brownie though. My biggest complaint being that they weren’t chocolatey enough. I also wished they were a bit more flakey on top while retaining their fudginess. I think I will be back to the drawing boards with this brownie experiment. Oh and another thing, in case you hadn’t been poking around here recently…I’m getting married in a month (exactly from today)! So yeah, there might just be a bit more wedding talk than usual. Just thought you guys deserved fair warning! omg just one month away!!! eeeeeep! i hope this month isn’t too stressful. 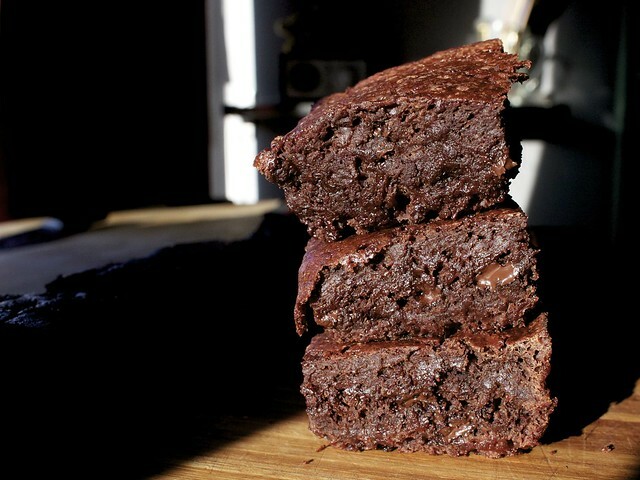 anyways, these look delicious…but i am still very curious about what went down at tara’s on brownie day. I just got the Joy of Vegan Baking but, sadly, haven’t used it yet. With vegan brownies, I’ve found that if you turn the flour into a ‘paste’ with a small amount of water, they turn out AMAZING. Practically no fail! You can go ahead and blame me for Sunday. Luckily everything is smoothing out. OK, I will. I hope you figure out your catering stuff! I really love this recipe: flaky, chocolatey, yummm. Omni-approved too! Brownies were the one thing that I had to test again and again. A good, fudgy vegan brownie was definitely a challenge. (I’m not a huge fan of cakey brownies. 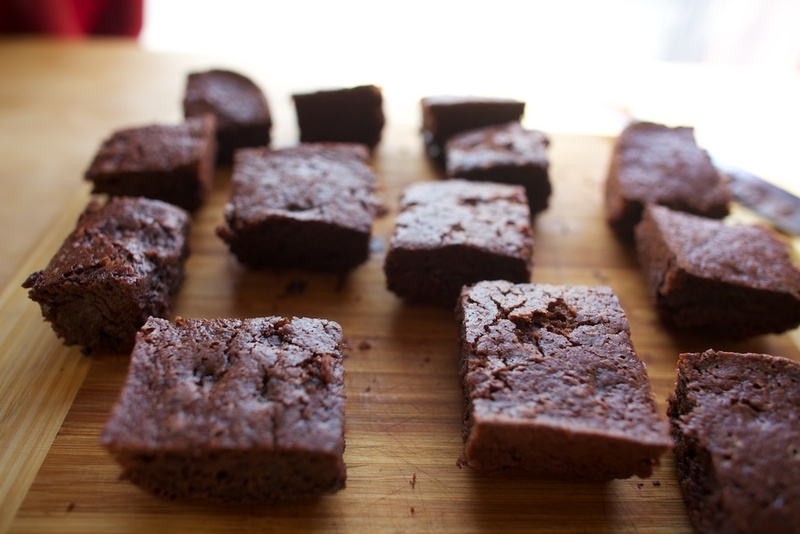 They’re okay, but they’re cake, not a brownie…). Maybe my big dreams of someone giving me a C’est La V cookbook deal will come true, and I can share my recipe! Oh man, they look amazing! I need to seriously work on my food photog skills. You and quarrygirl effing kill me! Speaking of vegan brownies: a few months back my husband, James, and I had a long conversation with the owner of Sweets for the Soul in Atwater Village about why we are vegans. We used to enjoy her delicious brownies regularly before converting from being vegetarian. Turns out the very next day she made vegan brownies for the first time. Unfortunately, we didn’t stop by and she did not have our contact information. And the brownies didn’t sell. All this to say, if you are in Atwater, stop by and ask for vegan brownies so that she’ll try them again. i will definitely do that. i’m near there often and have considered stopping in. more more vegan brownies. Proof and Cognoscenti Coffee – They regularly carry vegan tea cakes (though, in small quantity, so they go fast) and sometimes have these yummy spiced fruit loafs. They made us a special chocolate ganache cake over the holidays that even wowed our non-vegan families from Texas. Plus, Yeekai has soy milk and, even better, almond milk, for all of his delicious coffee drinks. We’re trying to convince him to add Hemp milk as a regular option, as it froths much better. Village Bakery – They regularly have vegan chocolate pudding, which is really great, and chocolate cake, which is not consistent, but often good. They have a good portobello mushroom and hummus sandwich on the regular menu and often have a vegan BLTA on the specials menu. They’ve started posting their vegan options on facebook, so you can check before going. will definitely try the coffee place. i have the portobello sandwich from village quite often, and had the blta just last week. it was great. agree though about the chocolate cake, wasn’t thrilled with it. I hope they work for you as well!